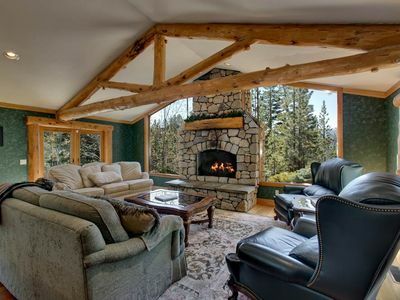 Aspen Hollow Lodge features over 4,000 feet of luxury, located on the mountain and backing up to the National Forest. This luxury vacation home has 5 bedrooms and can sleep 16 guests. 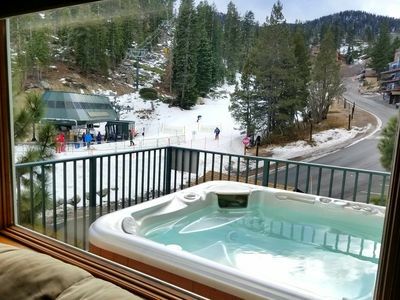 Located midway up the mountain off Kingsbury Grade, Aspen Hollow Lodge truly is a mountain escape. 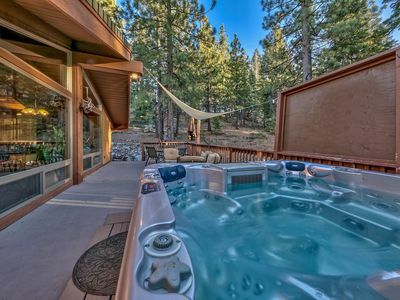 This home backs up to National Forest land, and has many hiking trails steps out the front door. 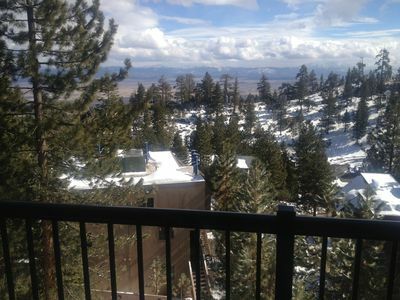 A short 10 minute drive down the hill, will put you right at the Stateline and the Heavenly Village. 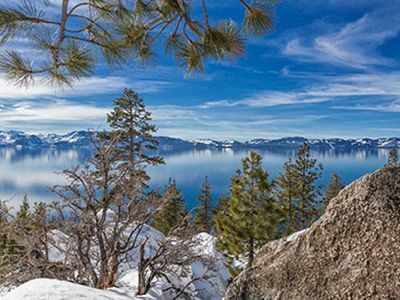 The state line is home to the local casinos, Edgewood Tahoe Golf Course, access to Lake Tahoe and many shops and restaurants. The Heavenly Gondola is located at the state line in the Heavenly Village. The gondola is the most popular access point to the ski mountain, and is surrounded by equipment rental shops, stores, bars and restaurants. In the heart of the Village there is an outdoor ice rink and the local movie theater. This five bedroom - five bathroom home can sleep 14 guests, over 4 4,000 square feet of living space. Built in 2002, this home still feels like new and is furnished with only the most luxurious furnishings. Cooks will love preparing meals in the spacious kitchen. All the appliances are stainless steel, complete with a double oven and a top of the line the cook top. The counters are expansive, allowing for great space for preparing food. The kitchen is equipped with all cookware, dinnerware, glassware and flatware needed for your vacation. Enjoy your morning coffee at the kitchen island, or in the breakfast nook that is surrounded by windows looking outside at the forest. For dinner, there is plenty of seating at the dining table that expands to seat up to 14 people. The living room is open to the kitchen, and also has vaulted ceilings with natural wood beam accents. The focal point of the living room is the large fireplace, completely surrounded in stone. This room will be the hub of your stay in this luxurious five bedroom home. Relax at the end of the day with a movie on the large flat screen television as you lounge on the cozy couches. For those who aren’t ready to relax, challenge one another to a game of foosball or play a game on the tabletop arcade machine located in the game room. Just outside of the game room is a bar with bar top, where you can whip up your favorite cocktail. The bedrooms are spread over the two levels and 4,000 square feet. The master bedroom is extremely spacious, and has a fireplace that acts as a divider to the jacuzzi tub. Those staying in this room can enjoy a large private en suite bathroom, with a soaking tub, separate stand up shower and double sinks. The second and third bedrooms can host a combined total of ten guests. The fourth bedroom features a queen sized bed, private bathroom and access to the back patio and hot tub. The final bedroom also has a queen bed, private bathroom and has door leading the the wrap around porch. This five bedroom luxury home is located a quiet street and is very private and is secluded from the neighboring homes. 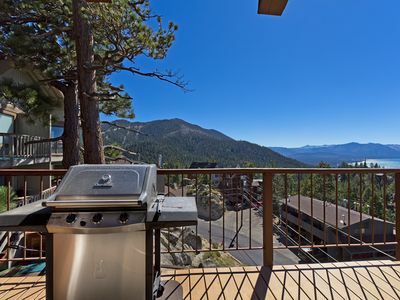 In the summer, you will love barbecuing on the back deck or lounging on the patio furniture. The deck leads in to the patio which hosts the private hot tub - great in any season! There is ample parking, in the cobble-stone driveway or in the two car attached garage. 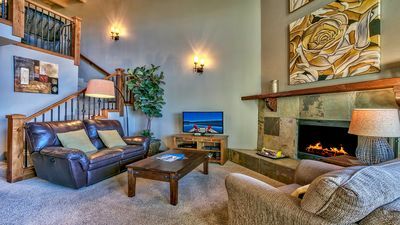 This home also has wireless internet and is pet friendly! Great Specials w/ 50% off add. Nights after Min.Stay ! Beautiful Tahoe Village. Steps to Heavenly Valley Ski Resort! Amazing Lake View Condo! 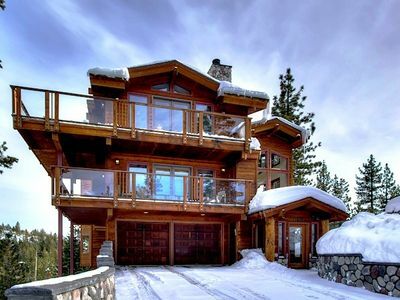 The Perfect Mountain Home for R&R and Skiing. The adventure begins near the lake’s sandy shores! Some of the steepest ski runs in the West!